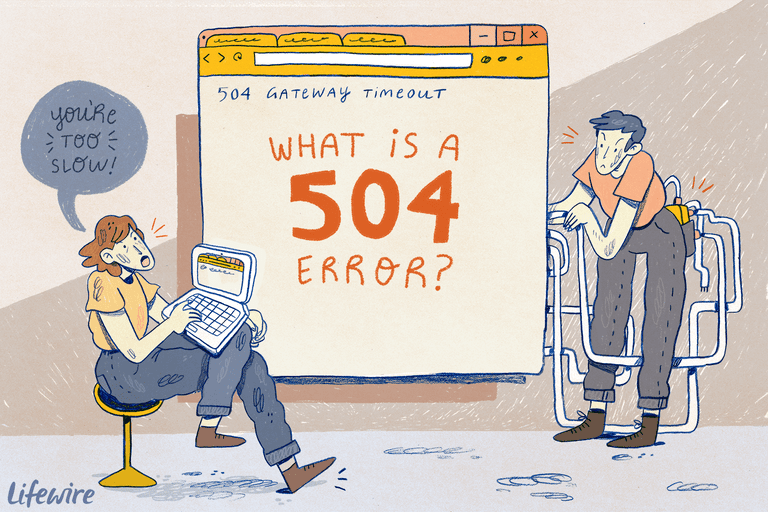 The 504 Gateway Timeout error is an HTTP status code that means that one server did not receive a timely response from another server that it was accessing while attempting to load the web page or fill another request by the browser. In other words, 504 errors usually indicate that a different computer, one that the website you're getting the 504 message on doesn't control but relies on, isn't communicating with it quickly enough. Are You the Webmaster? See the Fixing 504 Errors on Your Own Site section further down the page for some things to consider on your end. A 504 Gateway Timeout error shows up inside the internet browser window, just like normal web pages do. There might be a site's familiar headers and footers and a nice, English message on the page, or it could show up on an all-white page with a big 504 at the top. It's all the same message, regardless of how the website happens to show it. Also, please know that 504 Gateway Timeout errors can appear in any internet browser, on any operating system, and on any device. This means that it's possible to get a 504 Gateway Timeout error on your Android or iPhone phone or tablet, in Safari on a Mac, in Chrome on Windows 10 (or 8, or 7, ...), etc. Most of the time, a 504 Gateway Timeout error means that whatever other server is taking so long that it's "timing out," is probably down or not working properly. Since this error is usually a network error between servers on the internet or an issue with an actual server, the problem probably is not with your computer, device, or internet connection. Retry the web page by clicking the refresh/reload button, pressing F5, or trying the URL from the address bar again. Even though the 504 Gateway Timeout error is reporting an error outside of your control, the error might only be temporary. Simply retrying the page is a quick and easy thing to try. Restart all of your network devices. Temporary problems with your modem, router, switches, or other networking hardware could be causing the 504 Gateway Timeout issue you're seeing. Just restarting these devices could help. While the order you turn off these devices isn't important, the order that you turn them back on is. In general, you want to turn devices on from the outside-in. If you're not sure what that means, check out the link at the beginning of this step for a complete tutorial. Check the proxy server settings in your browser or application and make sure they're correct. Incorrect proxy settings can cause 504 errors. See Proxy.org for an updated, respected list of proxy servers that you can choose from. There are also several websites that offer free proxy server list downloads. Most computers do not have proxy settings at all, so if yours are empty, don't worry, just skip this step. Change your DNS servers, especially if all the devices on your network are getting the same error. It's possible that the 504 Gateway Timeout error you're seeing is caused by an issue with the DNS servers you happen to be using. Unless you've previously changed them, the DNS servers you have configured right now are probably the ones automatically assigned by your ISP. Fortunately, a number of other DNS servers are available for your use that you can choose from. See our Free & Public DNS Servers list for your options. If nothing has worked up to this point, contacting the website is probably the next best thing to do. There's a good chance the website administrators are already working to fix the root cause of the 504 Gateway Timeout error, assuming they're aware of it, but there's nothing wrong touching base with them. See our Website Contact Information page for help figuring out how to contact popular websites. Most major sites have social networking accounts they use to help support their services and some even have telephone numbers and email addresses. If it's starting to look like the website might be giving a 504 error for everyone, searching Twitter for real-time information about the site's outage is often helpful. The best way to do this is to search for #websitedown on Twitter. For example, if Facebook might be down, search #facebookdown. Contact your Internet Service Provider. It's very likely at this point, after following all the troubleshooting above, that the 504 Gateway Timeout that you're seeing is a problem caused by a network issue that your ISP is responsible for. See How to Talk to Tech Support for tips on talking to your Internet Service Provider about this problem. Come back later. You've exhausted all your options at this point and the 504 Gateway Timeout error is either in the hands of the website or your ISP to correct. Check back with the site regularly. No doubt it'll start working again soon. A lot of times this isn't your fault at all, but it's not the user's either. Start by checking that your server can properly resolve all the domains that your applications require access to. Very heavy traffic might result in your server serving a 504 error, even though a 503 would probably be a bit more accurate. In WordPress specifically, 504: Gateway Timeout messages are sometimes due to corrupted databases. Install WP-DBManager and then try the "Repair DB" feature, followed by "Optimize DB," and see if that helps. Also, make sure your HTACCESS file is correct, especially if you have just reinstalled WordPress. Finally, consider contacting your hosting company. It's possible that the 504 error that your website is returning is due to an issue on their end that they'll need to resolve. A Gateway Timeout error, when received in Windows Update, generates a 0x80244023 error code or the message WU_E_PT_HTTP_STATUS_GATEWAY_TIMEOUT. In Windows-based programs that natively access the internet, a 504 error might show up in a small dialog box or window with the HTTP_STATUS_GATEWAY_TIMEOUT error and/or with a The request was timed out waiting for a gateway message. A less common 504 error is Gateway Time-out: The proxy server did not receive a timely response from the upstream server, but the troubleshooting (above) remains the same. A number of error messages are similar to the 504 Gateway Timeout error because they all occur on the server side. A few include the 500 Internal Server Error, the 502 Bad Gateway error, and the 503 Service Unavailable error, among a few others. There are also HTTP status codes that aren't server-side, but instead client-side, like the commonly seen 404 Not Found error. Several others exist as well, all of which you can see in our HTTP Status Code Errors page.